I just love to make and use butterflies. To me it's a sign of new life. I belong to a group of women who are given a 12 x 12 sheet of cardstock. It doesn't matter what sort of card we make, but we must utilise the cardstock. This is one of the more unusual folds and it makes a very beautiful card, and although it looks complicated it is really easy to do. You need to do some measuring though but you will find all the instructions on the website. It has many titles but I have called it the Shutter Card and you will find it in the Kinetic Cards section in the NavBar to your left. This is decorated really well and the butterflies set it off and it is my favourite colour too. Thank you for sending in the photo Maureen and I certainly do like it, and I am sure many more visitors will too. Maureen that is an absolutely beautiful card. They are nice to do & Christina's instructions are easy to follow. Love it. 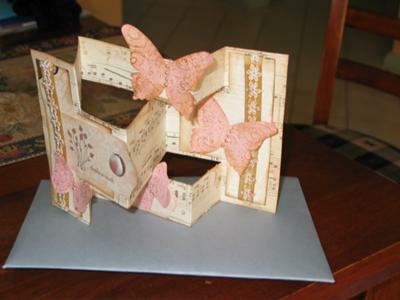 I love butterflies and I really enjoy making this kind of card, I never thought of combining them. This is great, thank you for sharing it. Have a great day.